I recently wrote about Gem Preiz’s new exhibition Geometry and Genesis , which forms one of the exhibits in this year’s Fine Arts Tour (FIAT) on display at the Galeria Mexico during the month of September. Also participating in this year’s Tour is another artist friend of mine, Derry McMahon. 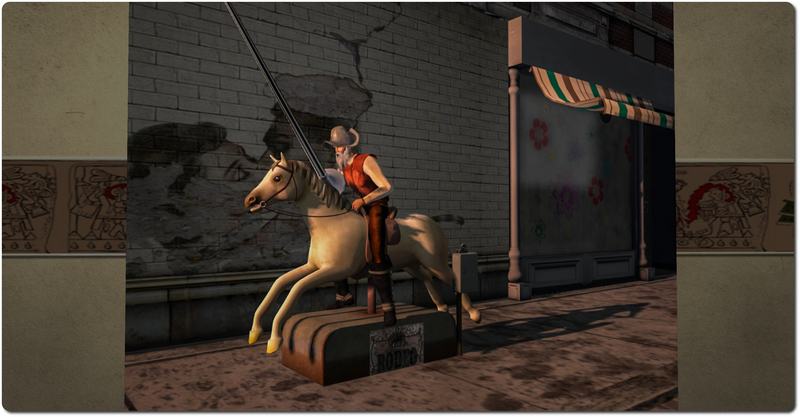 As the founder (now retired) of the Seanchai Library in SL, Derry has taken as the theme for her exhibit none other than Miguel de Cervantes’ much-loved literary hero, the Ingenious Gentleman of La Mancha himself, Don Quixote. We’re all familiar with the tale of this stranger in a strange land, on his quest to make the world a better place, and who sees the world not as it is, but as it should be. A tale which, as Derry noted to me in discussing her exhibit, a perfect foil to explore Second Life from the perspective of both imagination and the many ways in which we create and show our own visions of this strange and beautiful digital land. 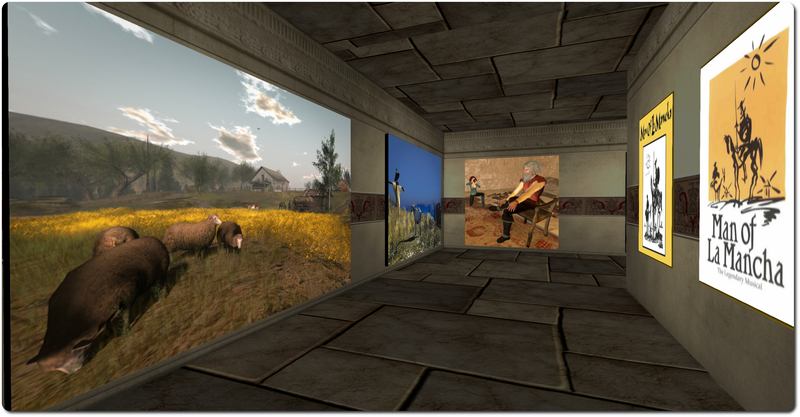 In presenting Don Quixote, Derry effectively takes on the role of visual chronicler to Alonso Quijano’s explorations through Second Life. She presents this idea very cleverly through one of the images in the exhibition, where she can be seen kneeling to photograph the Don, who appears none too certain about having his image captured. 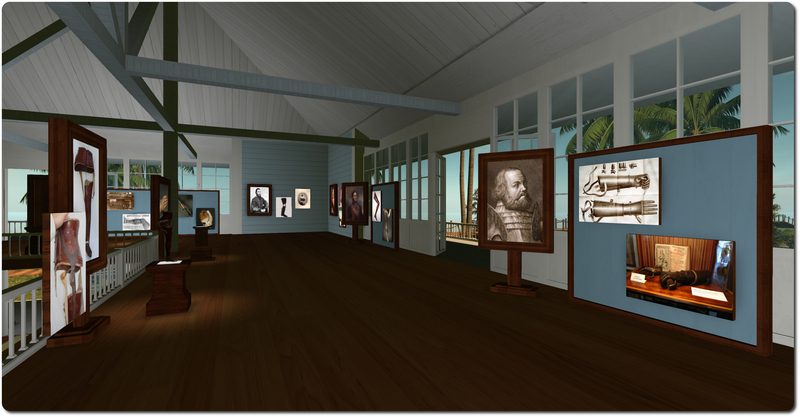 This is a charming and whimsical display of some 28 images captured from around SL and spread over two floors of exhibition space. Some of them feature motifs drawn from Don Quixote’s adventures – there are a few windmills to be found, together with a tavern scene, horses and jousting lances. Others are far more reflective of the stranger in a strange land element, and will likely raise a bemused eyebrow – as they probably did for the Don himself! The whimsy is evident in images of the Don sitting outside on a caravan, guitar by his side as if awaiting to be called up to a stage and perform – itself perhaps a subtle reference to The Man of LaMancha musical. Then there is the wonderful image of the Don astride a mechanical rodeo horse – a tilting of an entirely different kind! Derry mixes her art with images of posters from the Wasserman / Darion musical The Man of La Mancha (itself an adaptation of a teleplay by Wasserman) and which was in turn adapted into the 1972 Arthur Miller film starring Peter O’Toole and Sophia Loren, which also appears in poster form. Excerpts from the sheet music give further ambience to the exhibit. All told, Don Quixote is a delightful display, the images fresh and imaginative and which easily put one in mind of some of the memorable songs from the musical. When touring FIAT, be sure not to miss it. And on the subject of songs from the musical, there really is only one way to close this piece – and that’s with the marvellous Scott Bakula performing a medley from the musical. On Wednesday September 3rd, the Firestorm viewer turns four, and the team are inviting all who can to join them in a 4th anniversary party. September 3rd we turn four! Hard to believe but it has already been 4 years since we started developing viewers! First the popular Phoenix viewer and now of course the crazy popular Firestorm Viewer. 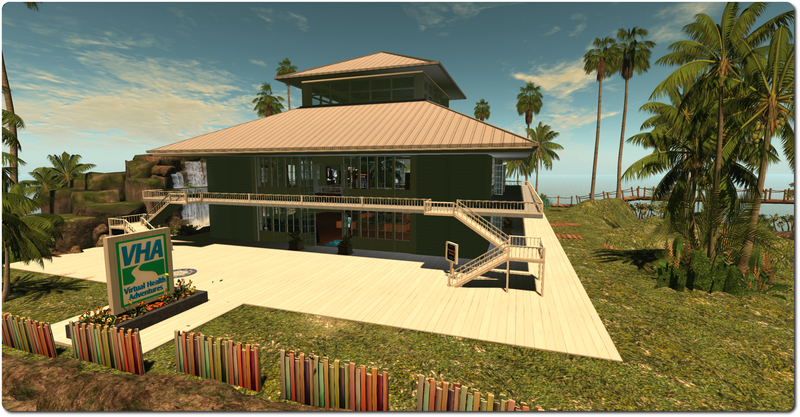 Firestorm is by far the most popular viewer used in Second Life and we have you to thank for that! After all… we couldn’t have done it without your support and encouragement! So as a show of our appreciation and with what is becoming a bit of a tradition for us… we have partnered with a couple of content creators to bring you some really cool free gifts AND organized a Rockin anniversary party with Rockin entertainment! Things will kick-off at 13:00 SLT on Wednesday September 3rd, at the Phoenix-Firestorm support Island, where Mankind Trace (aka Seth Regan in the physical world) will be starting things with a live performance, and he’ll be followed by Firestorm’s Ed Merryman, who will be spinning the discs until the last avatar drops (which in 2013 added up to a 18+ hour party!). Do keep in mind that the region’s capacity is liable to be limited, but people will be coming and going – so if you don’t get in the first time – try later! To further mark the event, two special gifts will be on offer. The first of this is another Firestorm cat from KittyKats. This one is called FireBall, and like the 2013 kitty, is fully interactive – it can wander, follow and even be held – and comes complete with a party hat, engraved collar and a cute matching bed! Also on offer for a limited time is a Firestorm themed Cafe style easy rider bike, donated by Desert Morning Motors. Inspired by the Classic American Motorcycles of the late 1930′s to the late 1960′s, and capture the spirit of the American chopper bikes. So get ready to be a Firestorm Easy Rider! Locations for obtaining both of these limited-time gifts will be announced through the Firestorm blog on Wednesday September 3rd, and will doubtless be available at the party! Which just leaves me to pass on congratulations and best wishes to Jessica, Ed, and the team on reaching their 4th anniversary! On August 25th, and continuing his work in providing preliminary support for the Oculus DK2 in his CrtlAltStudio viewer, Dave Rowe announced the release of version 1.2.2.41190 Alpha 2 for Windows. This is essentially the same release as the 1.2.2.41183 release for the DK2 made on August 19th, but sees positional head tracking support added to the viewer. This alpha release of the CtrlAltStudio Viewer adds positional head tracking support to take advantage of the DK2’s camera. You can look around, over, and under objects by moving your head. This adds significantly to the sense of immersion. Usage is the same as the previous alpha. With the DK2 configured in extended mode: use the Windows key + RIGHT CURSOR to move your viewer window onto the Rift’s display, then CTRL+ALT+3 makes the window full screen and switches into Rift view. A CTRL+Spacebar command that zeroes Rift sensor orientation and tracking position. A user warnings if Rift HMD or camera not found at start-up. There is still no support for basic shaders or the UI in Riftlook in the viewer, nor is there any Rift direct mode support. However, these are on Dave’s “to do” list for the future. As with the previously alpha release with DK2 support, this version will install into its own directory, allowing it to be used alongside the release version.